Nineteen single-story apartment buildings on a 12.25 acre site. This is an unusual occurrence but was dictated by deed restrictions, a common method of developmental control in the greater Houston area. 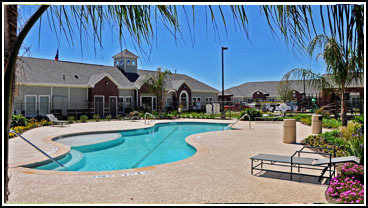 The apartments are very similar to others in this portfolio and were well received by the community. The tricky part of the project design would not be apparent to most observers. The property has a narrow street frontage and is very flat. Substantial storm water detention was required due to the size of the site. We worked closely with the civil engineer to develop an retention pond at the rear of the property and drained storm water into it.Tthen we ran restricted drain line back toward the street to tie into the public storm system. This development has a "single family residence" look to it because the scale of the property and the spaces are very appealing. The landscaping helps soften and make the spaces inviting. Vitro Design Studio has provided landscape design services for most of our projects for many years.